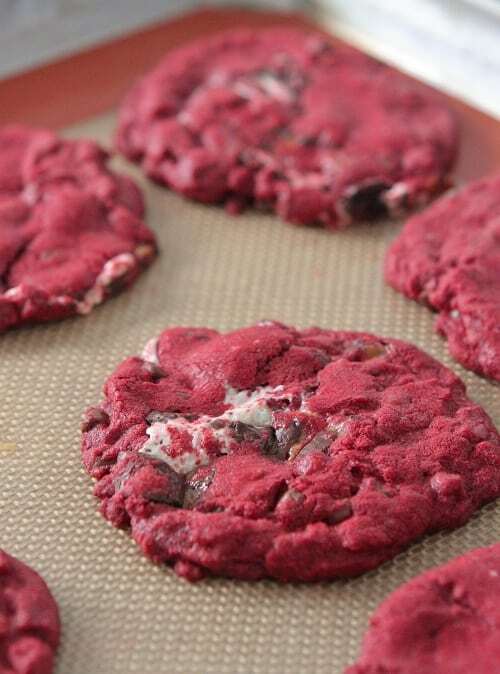 What is it about red velvet cookies that make my heart skip a beat? The deep fantastic red color? Who knows, but what I do know is that these simple, no fuss, make in about 15 minute cookies are to die for! Try them for yourself, you’ll see what I’m talking about. As if they are not good enough, I’ve added giant chunks of Dark Milky Way bars to the dough with some cute little mini chocolate chips. Perfect for your Valentine and even better for yourself, lol! Enjoy friends! 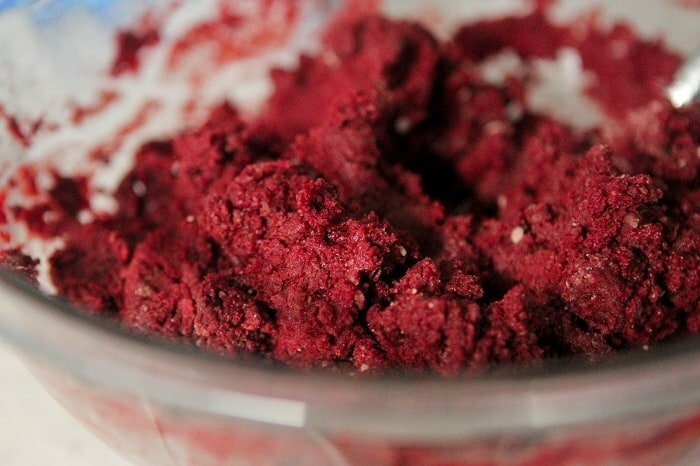 It’s hard to tell by this photo, but this is a red velvet cake mix. 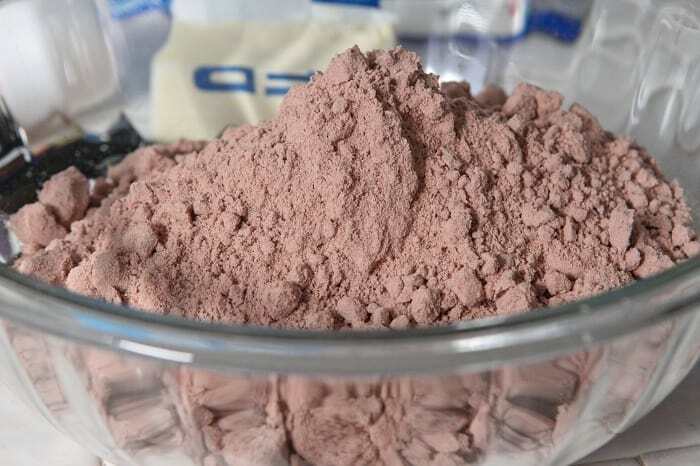 It looks chocolate until you start mixing in your wet ingredients. Add a semi-melted stick of butter to the bowl. Add one nice egg and a couple tablespoons of oil. How Fabulous is this dough? Ok, time for these midnight dark Milky Way bars. 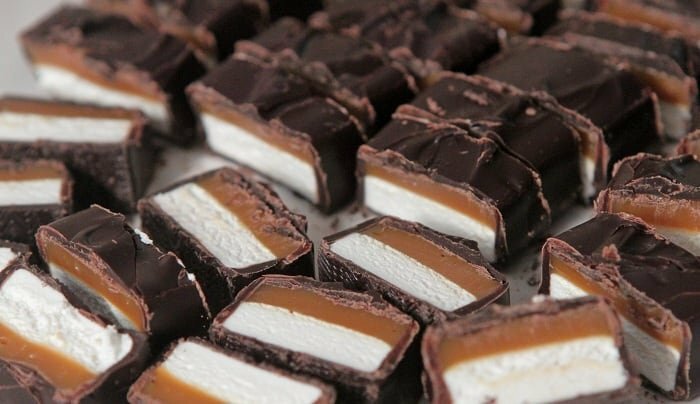 If you haven’t tried these before, they really don’t taste like dark chocolate and they are soooo much better than the original Milky Ways. Trust me on this one. They were so photogenic I couldn’t stop taking their picture, lol! Ok, into the bowl they go. 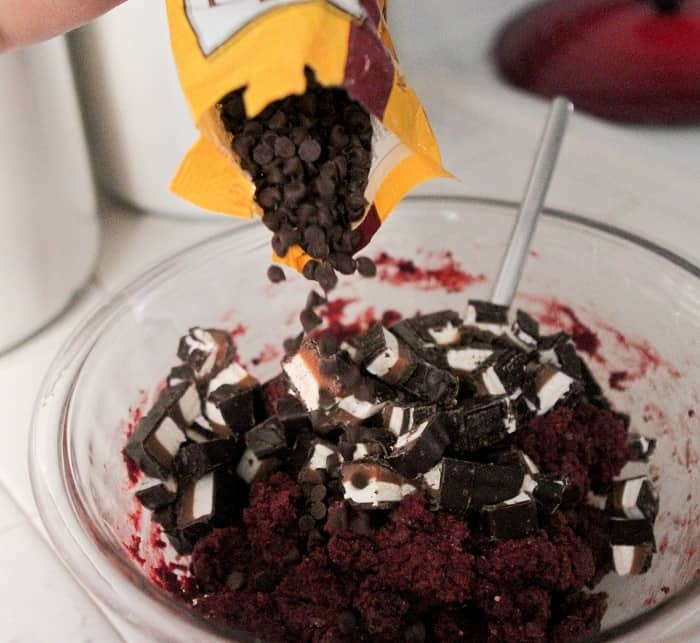 Add some mini chocolate chips right on top and give a good mix. Scoop nice scoops of dough onto your silpat liner. Parchment paper works great too. 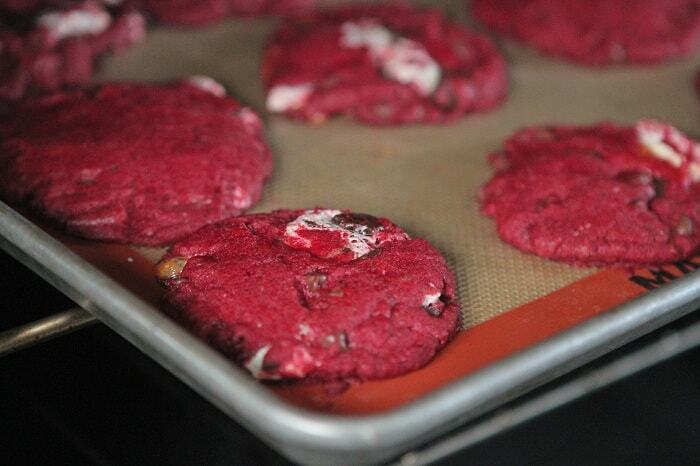 Press each cookie flat before baking. I like how they bake much better this way. Ahhhh, piping hot ready to come out of the oven. Look at that nougat! ….and this too 🙂 Enjoy! 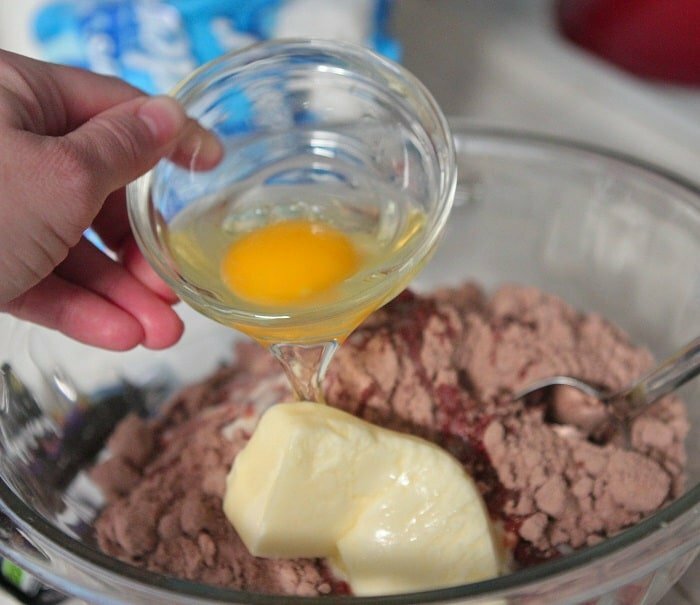 Place cake mix, butter, egg and oil into a large mixing bowl. Stir to combine. 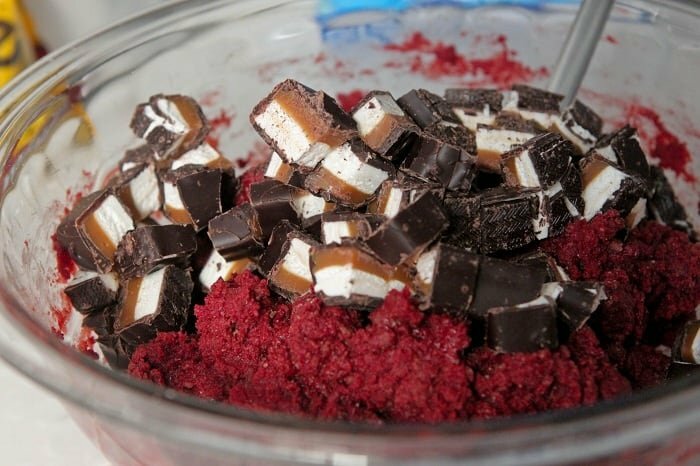 Cut up Milky Way bars into chunks and stir into dough along with the chocolate chips. Scoop dough onto prepared baking sheet placing about 1 inch apart. Press each cookie down almost flat about 1/2 inch thick. Bake for 11-13 minutes, until baked through. Let cool on baking sheet for 10 minutes before transferring to cooling rack. Jenny the cookies look great and the Milky Way Darks ARE indeed so photogenic 🙂 I love those candy bars and I bet in the cookies they are so good! Oh my word. I cannot believe how incredible these look! (OK, I can believe it. But still)! That color is truly amazing. 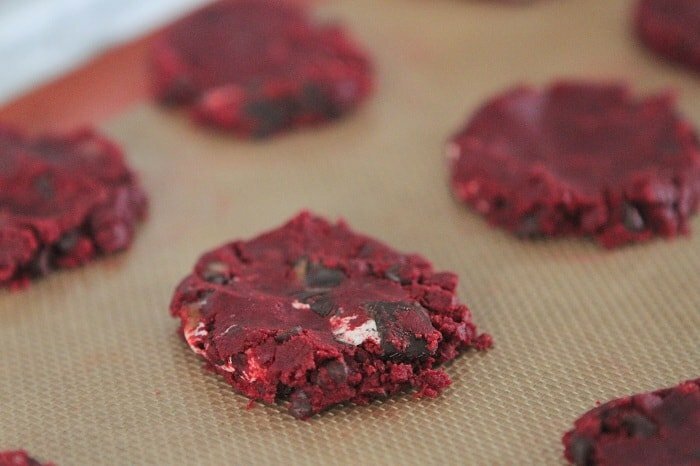 I have yet to make anything red velvet, but cookies seem like a good way to introduce it into my life! What a cute idea for Valentines Day. I love the color and those Milky Way bits. Jenny, these look and sound scrumlicious!! 😉 I’ll be trying these soon! 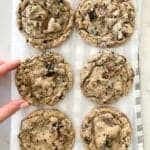 These cookies look absolutely perfect Jenny! I love the gooey caramel and nougat bits! Ooo, love the gooey-melty milk way centers. Perfecto! Those look so good! Perfect for V day! Definitely making these for Galentine’s Day!! looks awesome, but a 15 or 18 ounce cake mix? Yes, please answer. Size does matter – 15 or 18? lol. 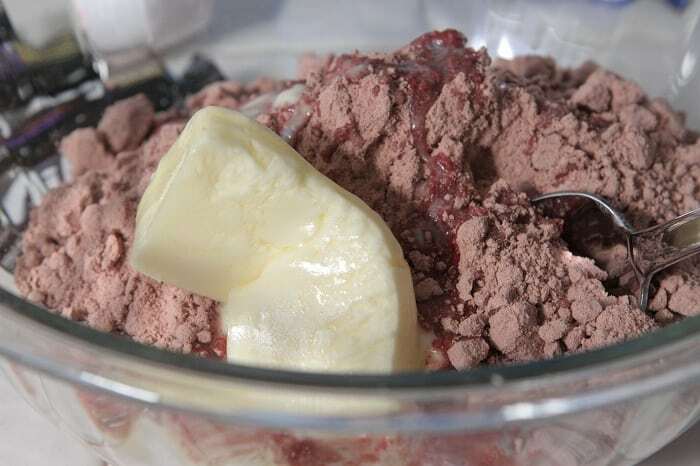 I used the Betty Crocker Super Moist 15.25oz red velvet cake mix and they worked out fine. I love the milky ways in there! So perfect! these are so festive and perfect for that lovey day! Hmmm, can you order from Amazon? Amazing! I bet these go down so smooth with a glass of milk! So ready for valentines 😉 delicious! Seriously loving these!! You are a rock star! looks like my kinda cookie!! 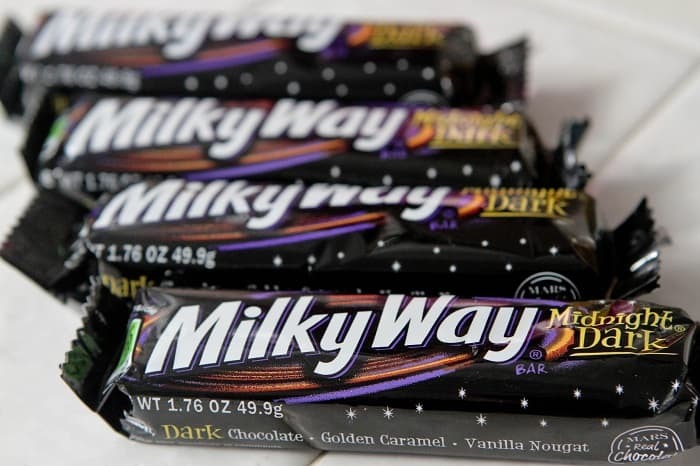 and love the dark chocolate milky way addition – good call! It’s nice to have a quick recipe that looks as good as this. And I could use one after watching that Budweiser commercial. I’m still sniffling. Thanks! I’ve got to catch that commercial, I keep hearing how sad it was!! Amazing! 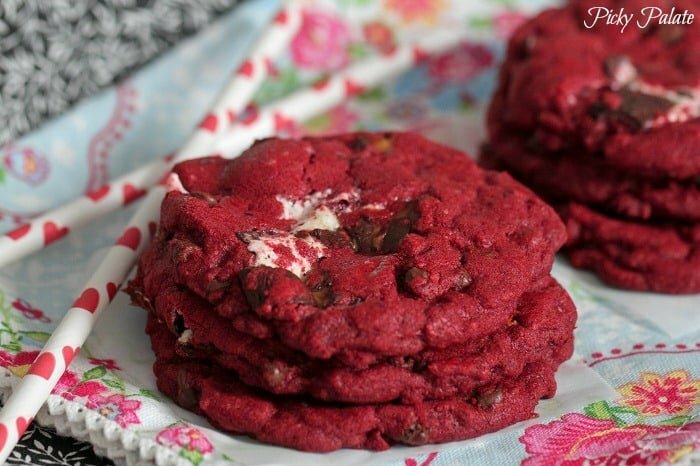 Red Velvet is definitely one of my favorites. 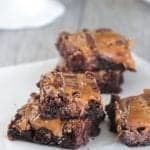 I’ve made similar cookies from a red velvet cake mix before, but the dark chocolate and caramel from the Milky Way is genius, and probably sends these over the top! I am just pulling this out of the oven! Just a couple of thoughts…. 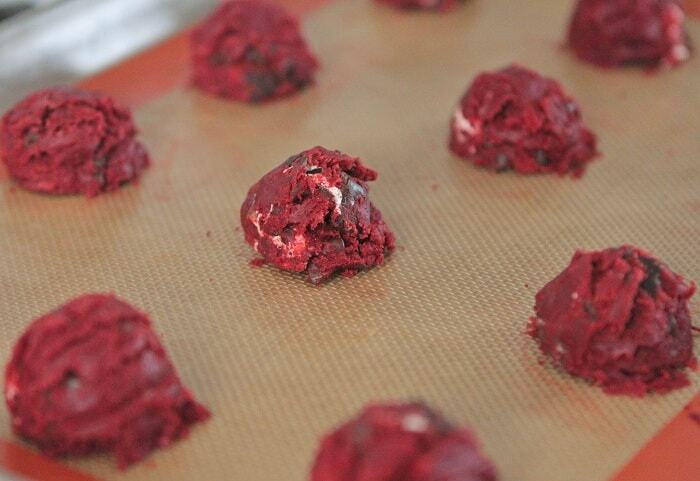 I used an 18.25 red velvet mix and the dough was very crumbly. 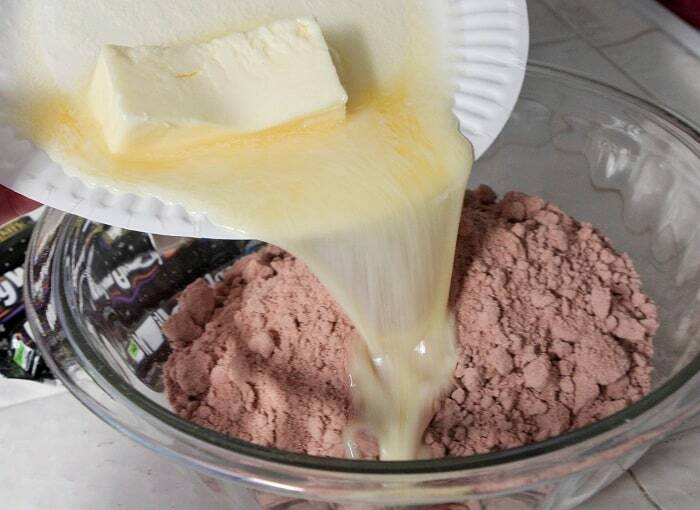 I’m thinking next time use a smaller cake mix or melt the butter instead of just softening it. Other than that, these are amazing! I agree!! I melted the butter but used the 18.25 mix and it was def more crumbly thank I liked. Otherwise, amazing cookie!! *Drools all over my keyboard* I LOVE Milky Way Midnight (the regular kind is too sweet) and who doesn’t love red velvet treats? So trying this! I’m kind of having 13 heart attacks right now. I’ve never been so happy. I can’t get over how amazing these are!!!! Now… I need a batch ASAP. Those Dark Milky Way bars are my favorite, these cookies are calling my name! Hi! So my question today is can you make cookie dough out of any cake mix? I thought about making vanilla coconut cookies with vanilla cake mix and coconut flakes. I always make cookies from cake mixes because they always come out soft and chewy instead of crunchy 🙂 SO amazing. wow! This looks amazing! And your photography is amazing! I have to say, i am obsessed with a lot of food blogs, and visit stacks everyday, but I love your blog, and I find myself trying out your recipes all the time. They are simple and they always have extra special bits tucked into them. I am so glad you blog and share! You are the best Jenny! I love that you used dark choc! Looks dreamy! 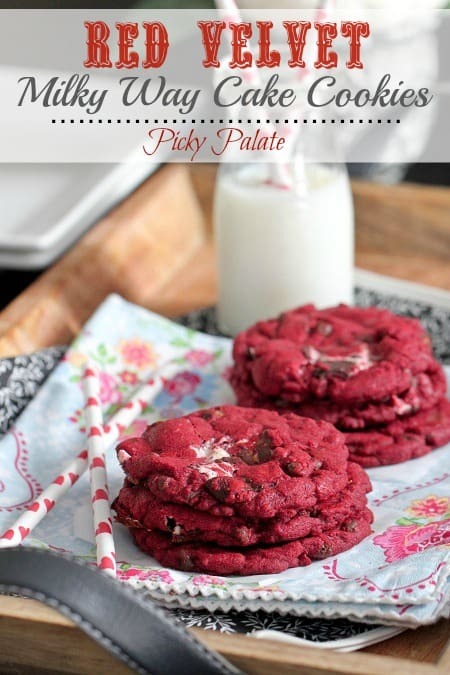 Perfectly pretty and yummy for Valentine’s day! 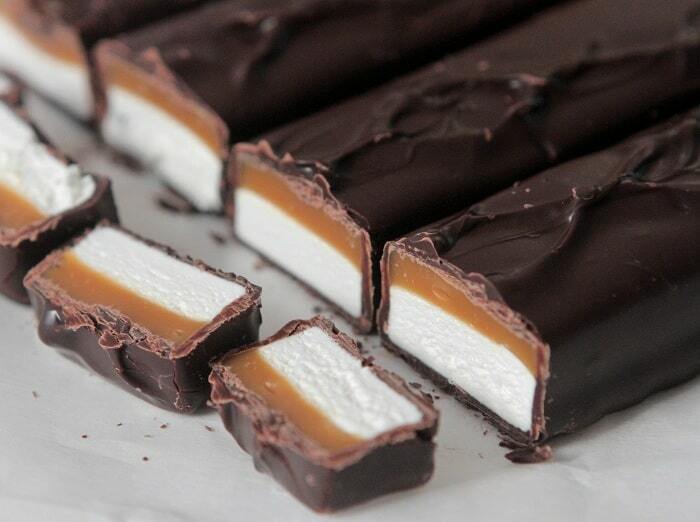 I think Milky Way bars are photogenic too! Milky Way Cookies!! Such fun!! these cookies look so good. Oh Lordy, these are amazing! Two of my favorite things in one cookie! Congart’s Jenny, they look amazingly delightful ! And so original ! 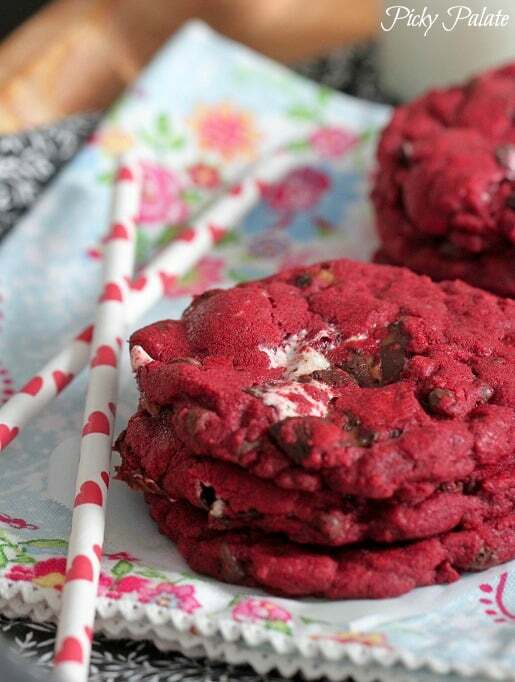 I wish I could find this red velvet cake mix here in Europe ..! I love your site and am a huge red velvet fan! I am sharing this recipe with my blog tomorrow and will list your site as well. Thank you! hi may i know how many grams of cake mix did you use? and do i have to sieve it first? thanks!!! 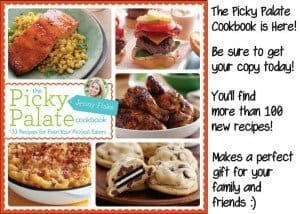 🙂 awesome pics n recipes u’ve got there! cant wait to try this out!